Just as the Sheshnaag, the serpent king, is the support of the whole earth, so is the Kundalini Shakti support of all tantra and Yoga. The word Kundalini is derived from the word ‘kunda’ which means ‘a deeper place’. The Kundalini, a Mahashakti, is residing in a deeper place, Mooladhara, the root chakra, situated at the base of a spinal column. Kundalini Yoga is a science that deals with the awakening and raising of kundalini shakti up the spine through energy centers called chakras. To understand kundalini yoga, it is important to understand Nadis and Chakras. Nadi means flow and the pranas flow through a complex network of Nadis to each and every part of the body. According to hatha yoga scriptures, there are 72,000 Nadis or flow circuits in the human body which control all the different bodily functions. Of these, Ida and Pingala and Sushumna are the most important. There are two major energy forces in a human body. One is life force or the vital energy called Prana and is channeled through Nadi Pingala and the other is mental energy called manas which is channeled through the Nadi Ida. Ida represents the moon, coolness and mental functions. Pingala represents the sun, heat, energy, and activity. These two forces viz. prana and manas flow throughout the body controlling every part, organ, and action of it. The ultimate effect of pranayama is the awakening of the sleeping Kundalini. The practice of Kumbhaka in pranayama produces heat and thereby kundalini is awakened and passes upwards along the Sushumna Nadi. One must have knowledge of the Nadis and chakras before learning and attempting to awaken kundalini by pranayama. Apart from the two Nadis Ida and Pingala, there is one more Nadi flowing up the center of the spinal column known as Sushumna. The force of Sushumna is Kundalini. Kundalini, the Shakti or the force is said to be sleeping in Mooladhara chakra in eternal Nidra (sleep). When a practitioner with his or her sadhana arrives at a state, when Ida and Pingala are balanced, this force (Kundalini) is activated and awakened. However, if the force kundalini is awakened prior to the balancing of Ida and Pingala, the Sadhaka may suffer severe physical, mental and emotional disturbances. All the karmas, Samskaras are contained in the flow of Ida and Pingala. These Samskaras or the impressions, both good and bad, have to be exhausted and purified first to awaken or activate the Sushumna. When the purification of the two Nadis i.e. 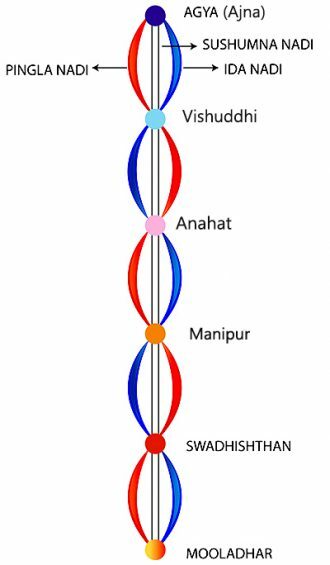 Ida and Pingala, has been achieved and they start flowing at the same time, the Shakti Kundalini is awakened and compelled to travel through Sushumna Nadi to Brahmarandhra, a higher center in the brain. By regular practice of pranayama, the nerve centers and the Nadis become purified and the prana easily forces its way up through the mouth of the Sushumna. Before the practice of Kundalini can be started, the practice of two processes will be worth mentioning: Samanu and Nirmanu. “Nirmanu” is done by physical cleansing or the Shatkarmas. Sit in padmasana. Meditate on ‘Yam’, the Bija Mantra of Anahata Chakra, whose element is air and has the color of smoke. Inhale through the left nostril while repeating the ‘Yam’ 16 times. Retain the breath till you repeat the ‘Yam’ 64 times. Then exhale through the right nostril very slowly repeating the ‘Yam’ 32 times. Inhale the breath through the right nostril repeating 16 times the ‘Ram’, the Bija Mantra of Manipura Chakra. Retain the breath, while repeating the ‘Ram’ 64 times. Then exhale slowly through the left nostril repeating ‘Ram’ mentally 32 times. Fix the gaze at the tip of the nose. Inhale through the left nostril repeating the Bija Mantra ‘Tham’ 16 times. Retain the breath repeating ‘Tham’ 64 times. Imagine that the nectar from the moon is running through all the vessels of the body and is purifying them. Exhale slowly through right nostril while repeating the Bija Mantra of Mooladhara Chakra ‘Lam’ 32 times. For Kundalini awakening Pranayama practice, concentrate on the Mooladhara chakra at the base of the spinal column. Concentrate at the Triangle which is at the center of the Chakra and is the seat of the kundalini shakti. Close the right nostril with the right thumb. Inhale through the left nostril counting three Aums slowly. Imagine that the Pranas are being drawn in with the atmospheric air. Then close the left nostril with the little and ring fingers of the right hand and retain the breath counting 12 Aums. Develop the feeling that the current is being sent down the spinal column straight into the lotus with a triangle at the center, the Mooladhara chakra. Imagine that the nerve-current is striking against the lotus and awakening the kundalini. Repeat the process starting with an inhalation from the right nostril in the same manner as stated above, using the same units, and having the same imagination and feeling. This pranayama will awaken the kundalini quickly. Do it five times in the morning and five times in the evening. Increase the number and time gradually and cautiously according to the strength and capacity. In this pranayama, concentration on the Mooladhara chakra is the important thing. Kundalini will be awakened quickly if the degree of concentration is intense and if the pranayama is practiced regularly. When the kundalini wakes up and passes through Sushumna and joins Ida and Pingala in the Ajna chakra, the lower forms of energy are withdrawn. The greater energy begins to flow awakening the different zones in the brain and also supplying energy to the whole body.